In the past, particularly as a younger investor, I noticed that I may feel inspired to invest in fast-growing, popular businesses when shares are in high demand; at other times, I may feel compelled to get rid of faltering, downward-trending companies with depressed stock prices. And, even though my feelings didn't typically drive me to act on these feelings, I often felt anxious during times of market turbulence. Develop a plan and stick to the plan. In a calm, lucid planning session, I decide how to invest and implement decisions according to an established timeline. A trading plan could be very general, such as invest $100 monthly in a broad market index fund, or more specific, involving buying and selling a certain number of shares of stocks on my watch lists. The content of the plan is important but even more crucial is its execution based on rational thought, not emotionally-driven behavior such as fear, anxiety, elation, or greed. Choose an asset allocation and rebalance according to a regular schedule. Choosing an asset allocation is a type of planning but involves establishing a broader framework into which I fit the trading or investing plan. Decide on the mix of stocks, fixed-income investments, real estate, etc. of my portfolio based on risk tolerance, time horizon, and investment philosophy. I can use asset allocation tools offered by my favorite brokerage firms. For example, Vanguard has an ETF tool that recommends both asset allocation and specific investment products that match this allocation. Periodically, monthly, quarterly, or yearly, compare my desired asset allocation with my actual allocation, and develop a trading plan to make adjustments and rebalance my portfolio so that the mix of investments stays true to my targeted allocation. Don't check my portfolio on a daily basis unless I want to take a rollercoaster ride. When stock market movements stir my emotions, then I may be better off ignoring daily upticks and downturns until I can distance personal feelings of contentedness from the growth or pullback of my portfolio. I never really noticed the severity of movement in stock prices until I started monitoring my experimental portfolios during the Grow Your Dough Throwdown (now in year two, version 2.0). I learned that fretting about day-to-day activity is fruitless (and frustrating) — whether I wonder if I paid too much for shares when they were soaring or should have sold before prices began souring — and counterproductive to focusing on the long term. Rely on my own research and trustworthy methods of investment selection. Whether just starting out or a seasoned investor, I've learned that I should trust myself more than the media. I don't always make perfect decisions when I rely on my methods, but I'll be less likely to allow emotions to rule my thoughts and behaviors. I may decide to completely tune out the noise, streamline the sources from which I gather news, or train myself to refrain from acting rashly. I've found that media outlets that report on general indicators of a business's long-term value have been helpful but those predicting short-term movement, harmful. As I develop my own methods for selecting investments, I've begun reviewing my decision-making rationale, which may include how I became interested in the investment, how I decided to buy (or sell), etc. Note what factors have influenced profitable decisions and which ones have caused me to make poor ones. Then, I refine my methods based on what has delivered the best results over the long term. Having cash on hand serves two purposes that allow me to stay calm and act prudently, particularly during stormy periods: 1) I have the money to pay fixed expenses, such as my mortgage or the weekly grocery bill without having to sell shares at all-time lows; and 2) I have money to invest during market dips so I can more readily view ups and downs as a natural aspect of investing. Cash helps me to appreciate both good and bad days in the market. It allows me to see that rises in my portfolio balance (and appropriately-timed sales of stocks and other investments) can generate funds for me to reach life goals. Plus, it enables me to take advantage of times when the share prices of watched stocks are affordable. Give day-to-day control of investment decisions to a third-party. A simple and effective way of preventing emotions from troubling me about market activities or prompting me to make rash and unwise decisions is to hire a qualified financial advisor to manage investments. A traditional wealth manager or a robo-advisory firm can help in this regard. Yes, I'll pay management fees that detract from investment returns. But the peace of mind plus the value of remaining firmly invested (and not constantly changing my investing direction) can make the fees worth the cost. When deciding to hire outside guidance, I've looked for someone who calmly devises and implements a sound investment plan, not someone who simply knows how to calm me down during market turbulence. 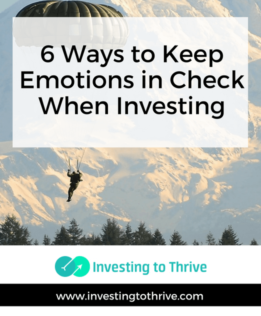 Based on my personal history and conversations with reluctant investors, those with less experience and intention tend to make more emotionally driven and damaging decisions, buying high and selling low rather than the other way around. More experienced investors have likely learned to focus on long-term goals and ignore short-term happenings; they tend to be wealthier, wiser, and happier. Practicing discipline in investing can not only produce better results but may also prevent anxiety and yield greater joy.